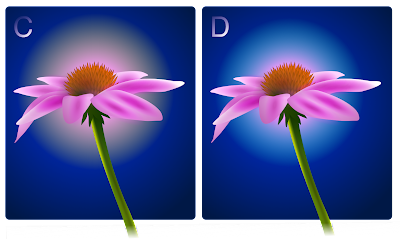 There are times when glows or shadows can be used to create contrast or definition to a drawing. One of the quickest and easiest ways to accomplish this is with a gradient. The gradient should contain two or more stops with the outermost stop set to complete transparency in order to blend with background behind it. Now, you might think that when you set the outer stop to 0% that color will blend consistently with the background. That is not always the case. Sometimes unexpected results occur. Read on to discover how to tweak the transparent color settings to make your drawing look fantastic! 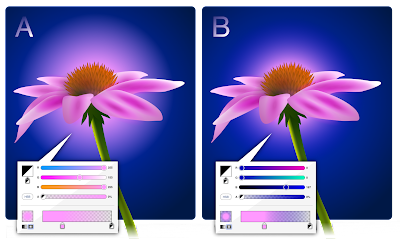 If you look at the color of the radial gradient behind the flower in figure A, you will notice the stop on the right has identical values as the one on the left, but is set to 0% transparency. However, there is a noticeable halo around the edge of the gradient (see figure C and D as well). The color of the transparent gradient in figure B has been tweaked to match the background color. Take note of the subtle change in the gradient preview area. There is a blueish tinge between the two stops. In this case, adjusting the color to dark blue helps eliminate the halo and blends the gradient into the background in a much smoother fashion. Depending on the look you are after, the color of the halo can be edited and used to your advantage. Examples C and D illustrate how changing the color of the transparent color stop can warm or cool the glow behind the flower. Experiment and see what you come up with! I'd love to see some of your work. © 2012 Ron Letkeman. Simple theme. Powered by Blogger.